My first Amazon author meeting! Romance writer Theresa Ragan has sold over 300,000 books on Amazon's self-publishing program. You can read more about her story here. 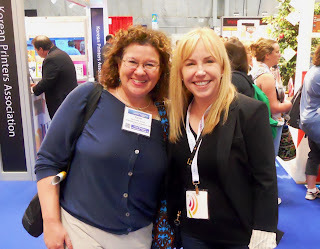 The New York Book Expo America was held June5-7 at the Javitz Center, and I was thrilled to attend my very first book expo as a registrant of Blogworld, held at the same time just next door. As a reader, writer, and book lover, I can say I was sufficiently awed and amazed by all the great authors I met, plus I came away with some very clear marketing lessons and takeaways. So here they are, along with the photos. Enjoy, and please feel free to post your comments here. I'm particularly interested in those who have attended book expos before, either as an attendee or author, and how they have influenced your views on book publishing today. There were more crowds and enthusiasm at this event then any other I have ever been to, period, and I've been to a lot! Not only that, the attendees were the best group you can have at an event -- they had already bought into the event by purchasing a ticket, and I overheard many say they came "just for this author," or "just for that author." I believe this is called "segmented marketing" at its best. 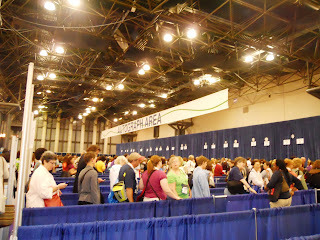 People were waiting in line for autographs and giveaways for specific writers. They knew what they were getting and they were willing to wait. Impressive. 2. Happiness Is A Trend - But Does That Mean We're All Depressed? There are many authors who have made it big with the Happiness theme, such as Gretchen Rubin, author of The Happiness Project, who was promoting her second book, Happiness at Home, pictured with the photos below. But I discovered at least 20 authors, both in the nonfiction genre as well as Spiritual and Self-Help areas, who were exploring happiness, and they didn't seem discouraged by the number of titles out there. Clearly, there's a demand, as so many of us are seeking happiness. So...that's a reason to be happy right there...even if you're just a little depressed... is it not? McGraw-Hill won the marketing award in my book, as you could not walk down a single aisle without seeing their giant red bags being carried all over the place. 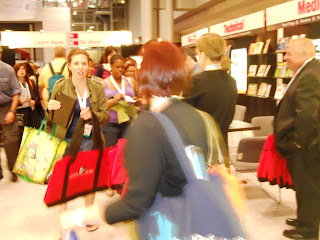 This was marketing completely done right: a bright red standout color, an oversize bag that was really the only one to hold all the books everyone was lugging around (I researched this thoroughly) and, not so easy to acquire. There were timed giveaways for the bags, and you had to, guess what, wait in line for that as well. 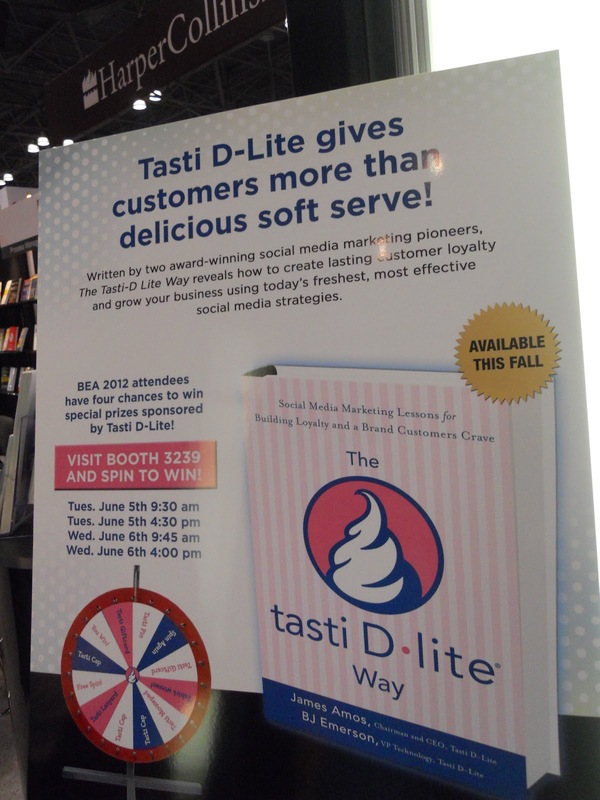 A great way to get people to keep coming to your booth, and a great way to create buzz. How many times did I overhears: "where did you get that bag?" 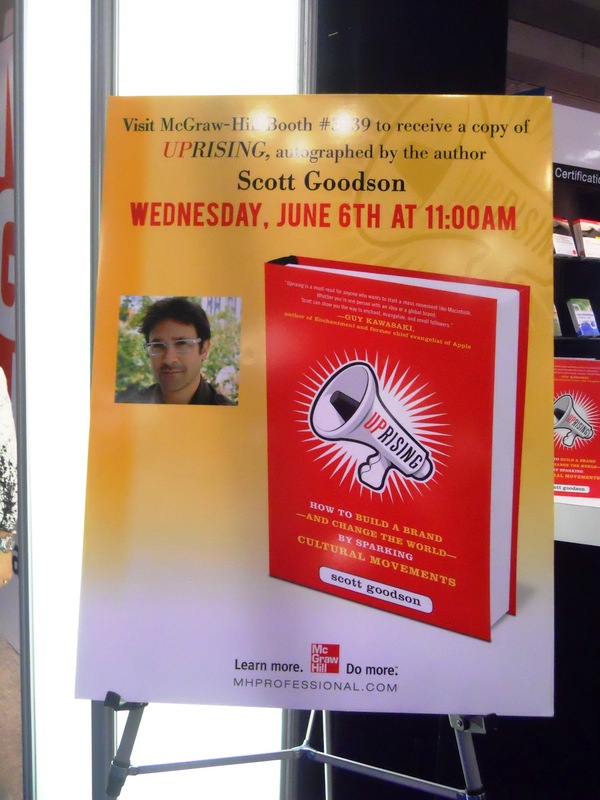 (despite the McGraw Hill logo prominently displayed on the side.) You would have thought it was caviar. 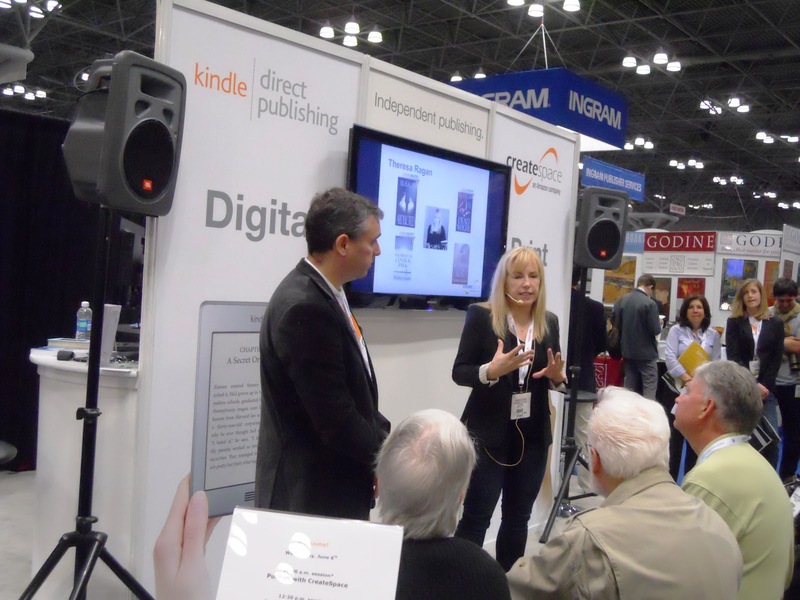 One of the major exhibits was for Amazon Kindle Direct Publishing, also branded as Create Space. Amazon's top selling self-published authors took center stage, and representatives explained how authors can upload their own books, create covers, decide pricing, and a host of other tools and features. Obviously, this is huge for authors who either can't get anywhere with traditional publishing, or don't want to wait for the full publishing cycle traditional publishing involves, which can be a year or longer. As a writer, I love the idea of not having to have permission in order to get published, and to in effect, be your own affiliate. Was it Captain Kirk? Lady Gaga? Spock? Tom Cruise? Nope. 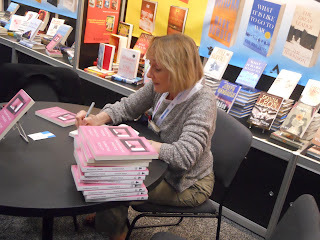 I witnessed with my mouth practically hanging open, the huge demand for Richard Ford the day he appeared as a guest for book signings and giveaways of his new indie novel, Canada, published by Ecco Press. Tickets for the signing were sold out, and the lines were practically around the block. Granted, Richard Ford is a huge name in publishing now, but he started small just like other authors and made a marquee name for himself, with integrity. Go indie authors, and let's take this as an encouraging sign for the future. And while we love digital, I have to say there is no online equivalent for the live buzz created by standing on line waiting for a signature, meeting the author, and getting the feel of a brand new shiny hot off the press book in your hands. So without further ado, enjoy the photo highlights below, and stay tuned to the blog and my Facebook page for a book giveaway offer coming soon! Harper-Collins was promoting a special anniversary edition of Charlotte's Web. 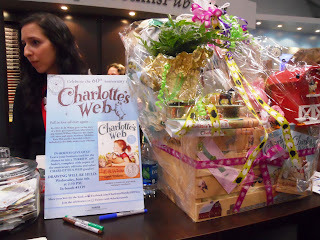 I admit the gift basket caught my eye as well. A Tall Order: The Harlem Globetrotters made an appearance and posed for photos to mark the 2013Guiness World Records.I felt a little short just watching, but have since recovered. 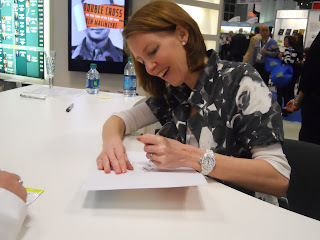 Happiness Project author Gretchen Rubin was so much fun to meet! I told her she had a great Facebook page, and she happily signed her upcoming sequel, "Happiness At Home." There was happiness all around. The ingenious red bag by McGraw-Hill. Oversize, in demand, and causing a frenzy during each "timed" giveaway. What else can one say? Books are apparently not dead. This was the autograph line during a typical afternoon. 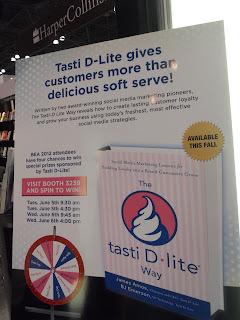 Who would have known the Tasti D Lite folks wrote a book? I take this soft serve seriously, so I'm ready for this one when it's out..I guess I'm a softy. 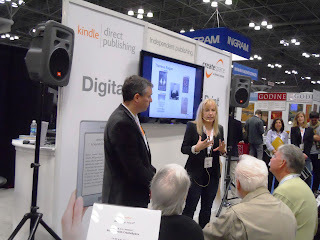 Here's Theresa Ragan again talking about publishing on Kindle's Create Space. I'm looking forward to reading Christine Schutt's Prosperous Friends, which looks like a great marriage gone slightly sour plot for fiction lovers. 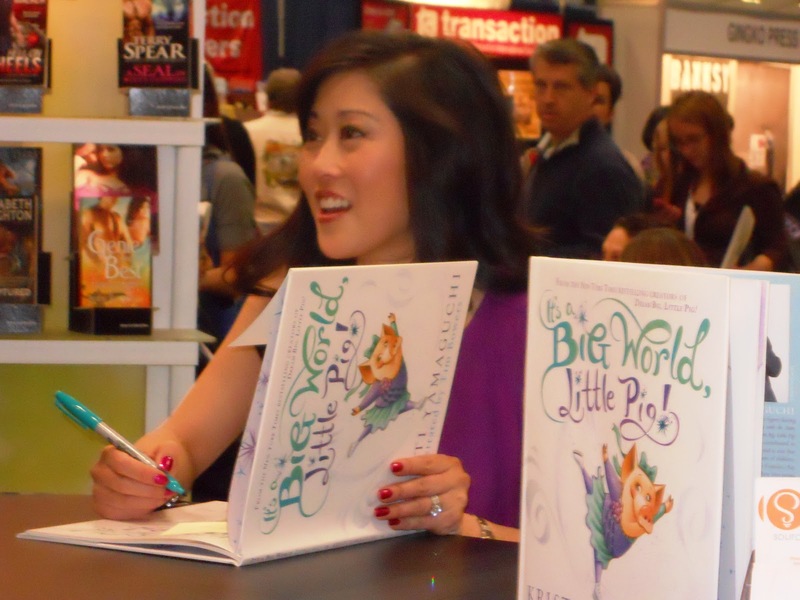 Stay tuned to the blog and my Facebook page for a book giveaway offer coming soon!